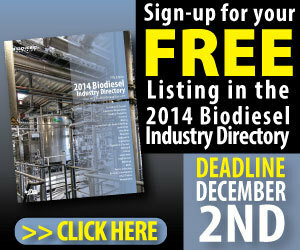 The National Biodiesel Board has launched an advocacy campaign on the pending 2014 RFS proposal, and the U.S. EPA draft proposal that was leaked. Keep reading to link to NBB's Fueling Action Center to send your letter, which takes less than a minute. 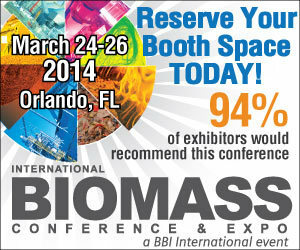 Piedmont Biofuels has been selected as host for the 2014 Collective Biodiesel Conference. The Pittsboro, N.C.-based producer is known for its community approach to biodiesel and its process technology innovations such as enzymatic production. Argentina's Foreign Ministry said duties were imposed "without a justified legal and factual basis," and are "clearly protectionist." The duties "leave no option for Argentina than immediate action" under WTO's dispute settlement understanding (DSU). Renewable Energy Group Inc. held a ribbon cutting ceremony to formally open its recently acquired 30 MMgy biodiesel refinery in Mason City, Iowa, and announced it has begun a $20 million project to upgrade the plant to a multifeedstock facility. New U.S. EPA statistics released Oct. 24 show the biodiesel industry has cracked the 1 billion gallon mark for the third consecutive year, with several months of production remaining. In September, U.S. producers cranked out 140 million gallons. Wilks Enterprise's new InfraCal 2 Analyzer for measuring biodiesel content in blends features better repeatability, multiple calibrations, unlimited data storage, optional internal battery pack, touch screen display and password protection. The Biotechnology Industry Organization, the Advanced Ethanol Council and 37 of their member companies wrote the White House yesterday to express grave concerns over a draft proposal for the 2014 renewable fuel standard recently leaked to media. Amyris and GOL linhas Aereas Inteligentes announced the signing of a MOU that could pave the way for GOL commercial flights to use biojet fuel in 2014. The deal was announced during the first commercial flight with biojet in Brazil by the airline.